For all you sweet tooths out there, the highlight of the CCB (Asia) Hong Kong Wine & Dine Festival’s Tasting Room – a stylish dining area presenting a series of outstanding culinary programmes – will most certainly be the Dessert Garden event on Saturday, 29 October, where an array of colourful, mouth-watering treats will bloom before your very eyes. Dreamed up by the Mandarin Oriental Hong Kong’s Executive Pastry Chef Yves Matthey, a keen gardener and hiker who was inspired by the beautiful natural scenery surrounding him in Hong Kong, the Alice in Wonderland-esque Dessert Garden displays a whimsical selection of 15 sweet delights – get stuck in and pick to your heart’s (and stomach’s) content. Lucky enough to attend a sneak preview, our first recommendation is to clear out some photos on your phone’s camera roll. If you’re anything like us, you’ll be snapping away from the moment you enter. 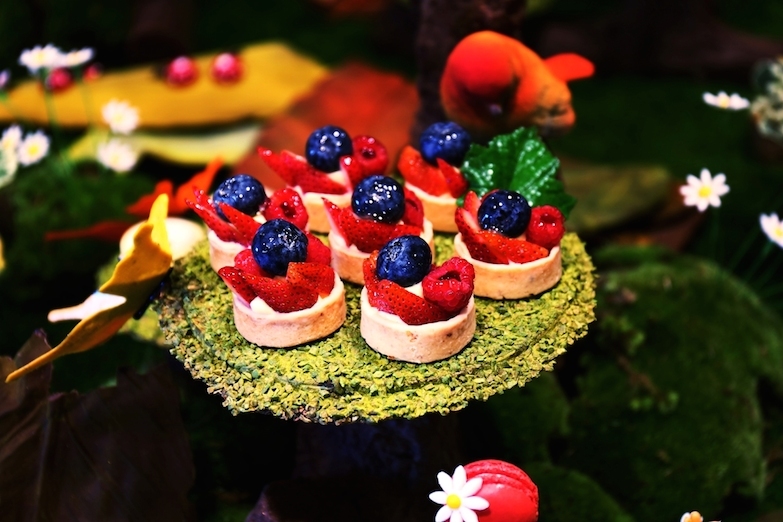 Think of the Dessert Garden as the most spectacular afternoon tea imaginable. To start off, diners will be presented with a traditional two-tiered tray filled to the brim with dainty finger sandwiches, including high tea classics such as house-smoked salmon with cream cheese, egg with cucumber, ham with mustard and roast beef with horseradish and watercress, as well as a selection of warm savouries, from a teeny-tiny croque-monsieur to a bite-sized chicken pie. A basket of mini scones with clotted cream and the Mandarin Oriental’s signature oh-so-fragrant rose petal jam is also yours for the taking. 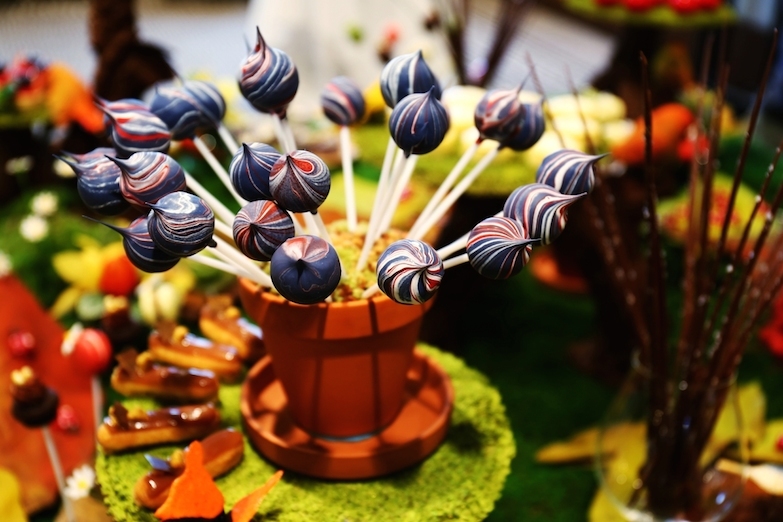 The showstopper, however, is the dessert buffet – like a Garden of Eden for those whose inclination veers towards the sweet. 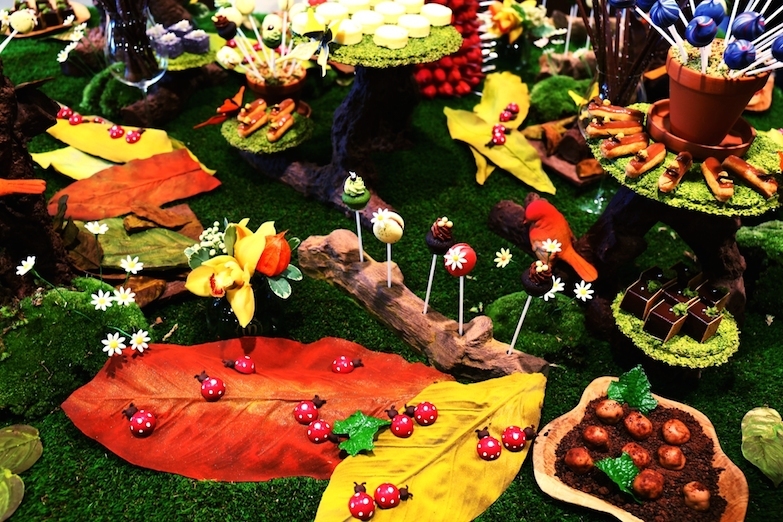 Everything (barring the moss and plates) is edible; you can even munch on the chocolate branches, birds and leaves. We were impressed with each dessert we sampled, but the highlights were Chef Matthey’s beloved 1963 cheesecake, reimagined as the creamy, dreamy filling for a bright red cherry tomato, the adorable cupcake lollipops and the delicious ‘potato’ tiramisu that provided an explosion of flavour and texture on the palate. 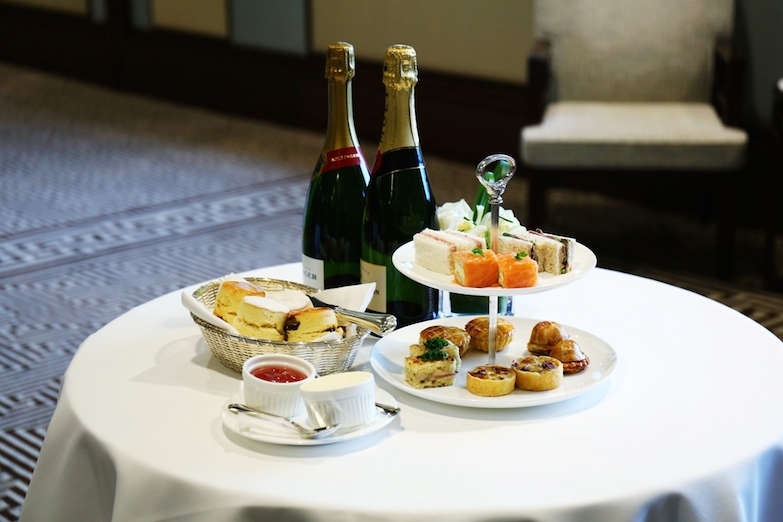 To pair with these delicacies, free-flow Bollinger and Moët & Chandon champagne is included in the price of admission. Bollinger, light and fresh in flavour, is the perfect match for the Dessert Garden’s fruit-based desserts, while stronger-flavoured Moët & Chandon holds up well against the more robust chocolate-y treats. 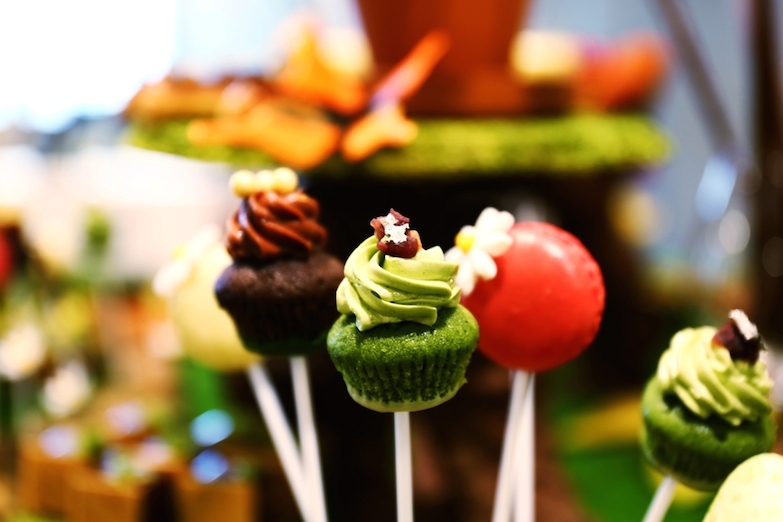 Unlimited bubbly and exquisite desserts: Saturday afternoons don’t get much better than this. Entry to the Dessert Garden on Saturday, 29 October (two sessions: 1:30–3pm and 3:30–5pm) is $688 per person, to include free-flow Bollinger and Moët & Chandon champagne. Organised by the Hong Kong Tourism Board, the CCB (Asia) Hong Kong Wine & Dine Festival opens to the public on Thursday, 27 October from 7:30–11:30pm and for the rest of the weekend will open its doors from noon until 11:30pm (closing at 10pm on Sunday, 30 October). An admission ticket is priced at $30 per person, with wine passes for tastings sold separately. 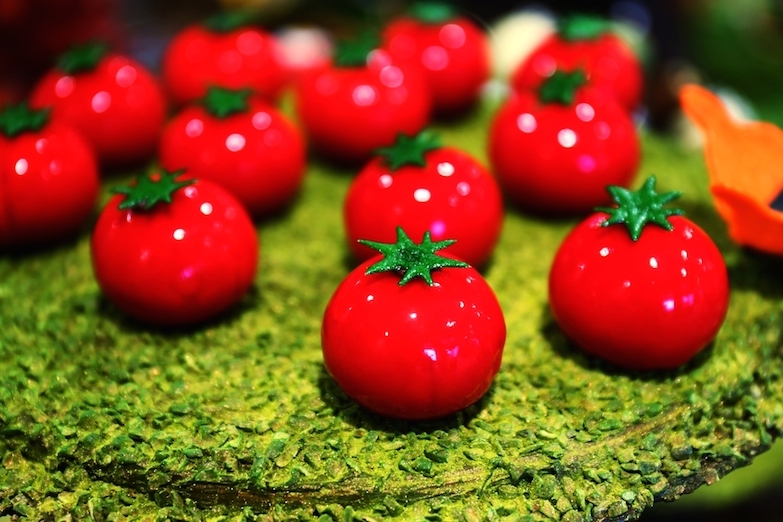 Upon entry, culinary explorers will have access to more than 410 booths offering a bevy of delicious food and drink options, organised in thematic zones. Admission is waived for advance purchase of wine passes and tickets and for Tasting Room events made on or before Wednesday, 26 October. Visit www.discoverhongkong.com/winedinefestival for more information.